We're rounding off our month-long look at great fitness and sporting equipment with one very unique device. Most activity trackers and heart rate monitors are either clipped to your clothing or worn on the wrist. But that isn't where your heart is, is it? To get the most accurate reading, as well as turning the notion of activity tracking on it's head, we check out the MyZone MZ-3. 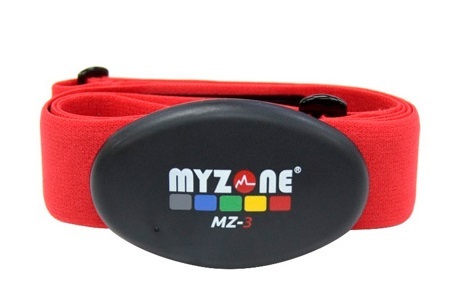 The MZ-3 by MyZone is a small, self-contained tracker, that has been designed to be worn on the chest, as close to your heart as possible. 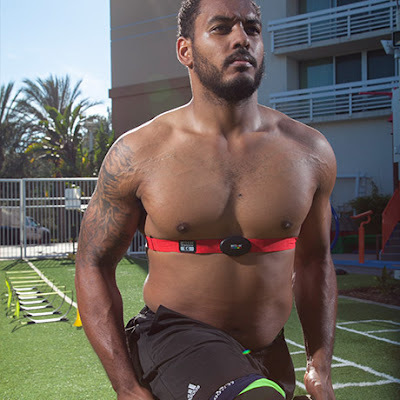 Although this can therefore get the most accurate reading of your heart rate, the MZ-3 also changes the way you think about your workouts, measuring and placing emphasis on effort, as well as actual distance, speed, and time. Thin, smooth, and flash drive-sized, the tracker itself features two metal studs on the back onto which clips a stretchy chest strap. Attach it, strap it around you, and you're ready to go. As with any other tracker it will record all your workout data, allowing you then to sync that with your smartphone running the MyZone app. There you can see your progress, set daily goals, and also connect with other people through the app's pretty impressive social aspect. However, the MZ-3 differs in many ways to standard trackers. For a start it can measure your efforts with a 99.4% EKG accuracy, giving you instant readings so you can track your heart rate as you go, no matter what you're doing. Further more, the app can interpret all that data and take into account your body type and length of time you've been working-out to display your effort. You might have run three miles every night for a week, but it can tell which if those sessions required the greatest amount of effort on your body's part, rewarding you accordingly. Uniquely the MyZone MZ-3 can also connect with other apps and devices, so if you have an established favourite running app you should be able to sync the MZ-3 to it. 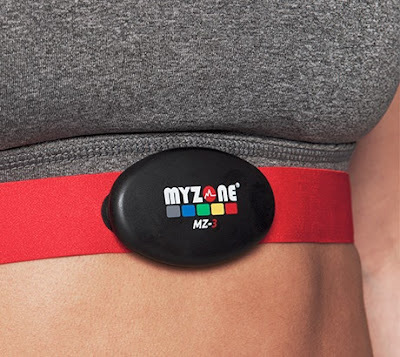 Also (and this is something we were unable to try, not being members of any gym or club) the MZ-3 can connect with display systems available to gyms, meaning that as you work out in a group, your heart rate, effort, and other data, can be displayed on screen with everyone else's. Actually, pretty glad we couldn't test that particular feature. In use, the MyZone MZ-3 is comfortable and discreet, but it does take a couple of days to get used to having the band around your chest. The strap feels like how we assume a bra feels to wear (yep, blokes here), but the tracker itself is barely noticeable. Get the strap to the correct tightness and it'll stay there, seemingly very securely. The app is also very well put together, with all functions being quite intuitive. If you've never used an app like this before it might take a while to fathom out, but as soon as you sync the MZ-3 to it after your first workout, everything will make sense and you'll be presented with all the info you need. There are a few downsides to all this, however. For one, the MZ-3 is pricey, weighing in at £129.99. That is a lot, and if you're merely looking for a tracker to count your steps and measure your distance, you can get something for a tenth of that cost. There are also some limitations in convenience, what with it being a hidden-away tracker. Unlike a wrist-worn device you can't see any of your data quickly and easily without looking at your phone, and there are no physical controls for your music. Still, if the data captured by the device is your number one priority, and if you are actively looking to challenge yourself and work out in a group, we really can't fault it. For those taking their fitness seriously, it's a winner.